Like I said a few days ago, my boyfriend and I thought that our dear friends--the ones who bore with us all summer while we painted and problem-solved and were often just too tired to be much fun--deserved a party. So last weekend, finally, we flung open our doors and had them all over for a little food and drink. My boyfriend played bartender and had everyone sipping our lemony riff on this gin sparkler (the Meyer lemons are here at last!). I had the oven roaring and passed around various little nibbles just as soon as they were cool enough to pluck off the half-sheet. 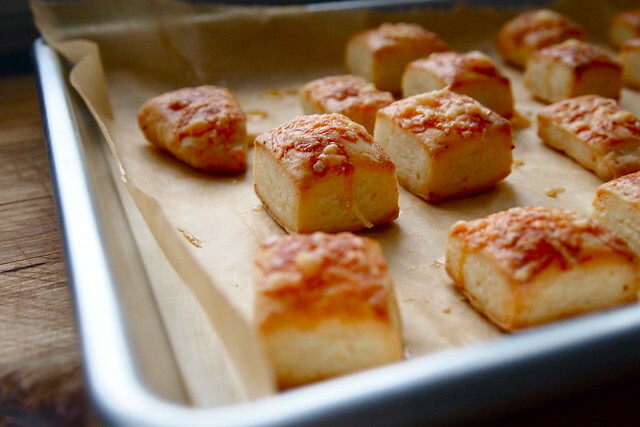 There were gougères, a pizza patate, spiced hummus, pear bread, carrot cake truffles, and, of course, these little pillows of buttery, flaky, cheesy goodness right here, pogácsa. You should know by now that just about anything that puffs up golden and buttery in the oven is enough to get me excited. Butter and a hot oven work magic together. You can't get me away from the oven window if I have pastry going. I have to peer in every few minutes, cheer on the pastry: puff now, you can do it! But these pogácsa have had me especially excited lately, not just because of how amazing they are--though they are that--but because the recipe for them is a family recipe, and I'm very happy that my friend Agnes was willing to share it with me and with you too. I first had these pogácsa at her place last winter when she graciously invited a crowd of us over to make up for a cancelled class. We piled into her living room, listened raptly, and thought hard about De Motu Animalium...until the smell of pastry in the oven, rich and tantalizing, drifted down from the kitchen. I, at least, found it hard to concentrate. It was a long twenty minutes before class was over and the pogácsa came out. And when they did, we snapped them up fast. Like I said, buttery, flaky, cheesy goodness. I had to ask for the recipe the next day. Pogácsa, generally speaking, are a pastry of Hungarian provenance. They vary a lot in size, consistency, and flavouring--some are more biscuit-like, some are yeasted, some are made with pork cracklings. 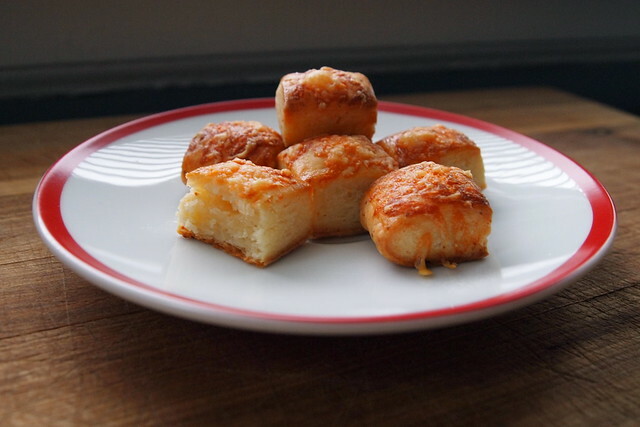 The pogácsa that Agnes' family makes, though, are more like bites of puff pastry than anything else--but with a tang and tenderness that remind me a little of a good buttermilk biscuit. The dough is simple, just equal parts flour, butter, and farmers' cheese, along with a little salt, repeatedly layered and rolled out. And with that taken care of, you just let things work their magic in the oven. Note: Farmers' cheese. It's a soft, fresh, tangy cheese often sold in plastic containers by the pound. I haven't had any trouble finding it in Illinois and New York, but Agnes says that she never managed to find any when she was living in California. Make ahead. You can certainly complete the turns a day or two before you bake off the pogácsa, so long as the dough is tightly wrapped in the refrigerator. I have a handful of cut squares that I tucked away in the freezer. I'll let you know soon how well they fare there. Update, 01-25-12. The pogácsa bake up beautifully from the freezer. Once you've cut up the dough, place the pieces on a parchment-lined half-sheet and chill in the freezer until firm, about half an hour. Remove them from the half-sheet and store in a zip-top bag. When ready to bake, follow the directions as written below. Cream the butter in a stand mixer, 1-2 minutes. Add the farmers' cheese and mix to incorporate. Then, add the flour and the salt, mixing just until incorporated. Turn the dough out onto a lightly floured surface and pat into a rough rectangle. If it's warm and tacky, wrap it loosely in plastic wrap and leave it the refrigerator to chill for at least 30 minutes. When the dough is ready, generously flour a clean work surface and a rolling pin. Roll the dough out into a rectangle, about 8 by 15 inches and a 1/4-inch thick, and then fold the dough into thirds as you would a letter. (The dough might be a little tacky and difficult to work with at first. It will improve with more rolling and folding.) Rotate the dough 90 degrees and repeat the rolling and folding. This completes a full turn. Return it to the refrigerator in plastic wrap to chill for an hour. Complete 1-2 more full turns, leaving the dough to chill for another hour between turns. The more turns, the flakier the pastry will be. 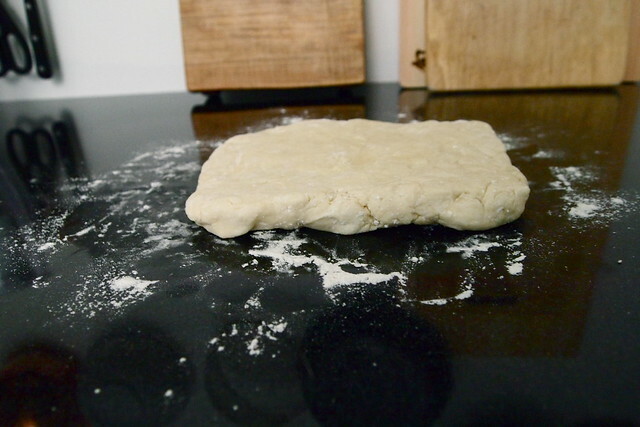 Heat the oven to 400 degrees F. Roll out the dough into a rectangle, about 8 by 15 inches and a 1/4-inch thick. Cut bite-sized circles out of the dough, as would be traditional, or cut it into squares no less than 1 1/4-inches on each side. Place on two parchment-lined half sheets. 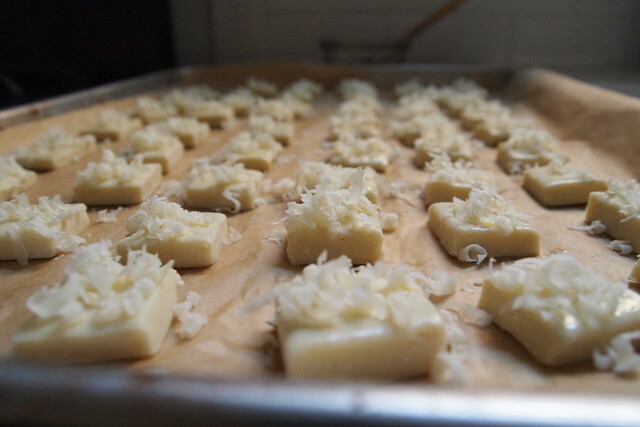 Brush each with a little egg wash and dust with the parmesan. Bake in the centre of the oven until puffed and deeply golden, about 20 minutes. Serve immediately. Makes about 60 bite-sized pogácsa. These look delicious, your photos are stunning too! Aw, Amy, that's really sweet. I haven't really had that much practice...it's all in the planning, I think. You just have to pick appetizers that you can make ahead and have waiting to pop into the oven when you're guests arrive. I made a master grocery list, a schedule, and then just did a little bit in the kitchen every day five days before the party. The only real hitch in my setup was that almost everything that I had planned needed to be eaten right after coming out of the oven, so the food kind of came in 30 minute bursts and I had to run the oven all night. I'm sure that my boyfriend and I could put away 60 of them over the course of a night...but I actually only ended up baking half of them for the party because my guests did not take me seriously when I told them to come hungry. They admitted outright that it had been a mistake! She also has a recipe for the pork crackling kind (toportyus) of pogacsa, which looks fascinating, but I disapprove of her recipe for turos pogacsa (it substitutes cottage cheese -- dont do that!--instead use the one here). Thanks, Em. I'm mostly into scepticism (from Descartes and on) and self-knowledge at the moment, but I'm still at the coursework stage of my program, so I'm not sure exactly where that will take me yet. I can never find farmer cheese (wooo California FTW!) but, I've had pretty good luck with plopping a container of full fat cottage cheese into a colander and letting it drain for a few hours. Heck, Nancy Silverton says she uses cottage cheese in place of ricotta if she can't find any artisanal ricotta. I have to make these ASAP. Love pogácsa. Reminds me of my childhood. Your boyfriend is a lucky boy. I made a similar replacement for 'farmer's cheese' since there are MANY cheeses that are called that. A combination of home made paneer and drained cottage cheese seemed to work pretty well. :) I've also made a couple of variations of the pork crackling pogasca ... trying to copy the ones my Romanian mother (from the former Yugoslavia) made while we were growing up here in south-western Ontario. Pork crackling pogasca do sound amazing. I'll have to look into them once it's cool enough to bake again. I didn't realize that Romanians made pogasca too. I guess it must be a regional thing--my boyfriend grew up in Constanta. Katie! Thanks for publishing this recipe. I've had this recipe tagged for months and finally decided to make them this week. I have a lot of experience in making laminated doughs, but this recipe and food is totally unique to me. Farmers cheese + butter + not having to proof = amazing! They turned out so much better than I was anticipating. Really love your blog.